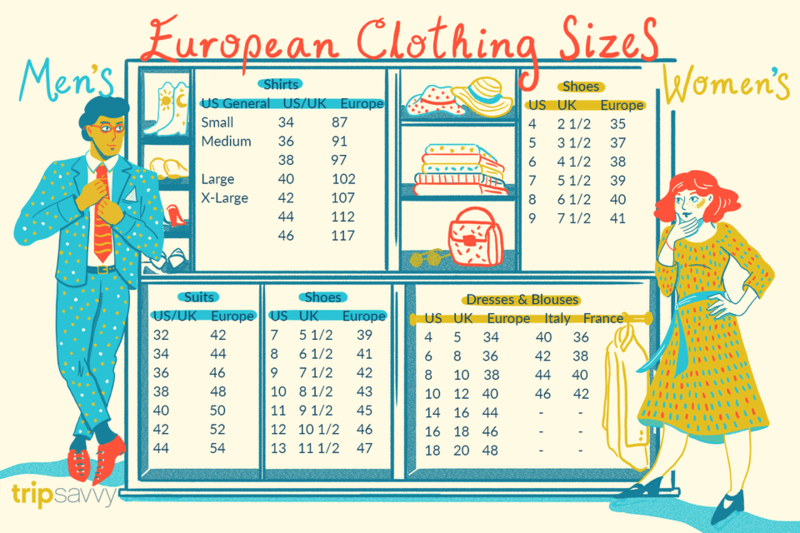 If you're planning on shopping for clothes in Europe, it is important to learn the differences between American and European sizes. Size conversion isn't an exact science as everyone has a different body shape, size, and type. But if you have a rough idea of the differences in American and European sizes, you'll at least know where to start. Luckily, most stores in Europe will have salespeople who can speak enough English to provide assistance about sizing. The more expensive the store, the greater the likelihood of English fluency. For sizes that depend on measurements, remember that one inch is equal to 2.54 centimeters (although 2 1/2 is probably close enough to start). Clothing sizes in Europe start in the 30s, so don't be confused if you're used to low women's size numbers that are common in America. If you're shopping in the United Kingdom, you should try on the garment two sizes up as the exact fit can vary. Note: The European sizes shown below apply mostly to Germany and the Scandinavian countries, and don't apply to Italy and France. If you plan on buying shoes on your next trip to London, you may want to try on a pair down a few sizes than you're used to. In Europe, shoe sizes are similar to clothing in that they start in the 30s. Men's shirt sizes are more than double the size number as those in the United States. Don't be surprised to see numbers in the 80s through 100s. There are many department stores and local boutiques throughout Europe where you can be fit for a suit. If you're buying a suit abroad, be sure to go to a professional who can help find a tailored suit for you. Shoe sizes in the UK are smaller than in America, while Europe sizes are much larger (typically in the 40s). If you get confused, you can always ask a sales assistant to measure your feet before trying on different pairs. As with any shop, it's best to greet the European shopkeeper with a nice "good day" (or "good morning" or "good evening" as appropriate) in the local language. Shopkeepers often consider their shops an extension of their homes and will extend the same hospitality. Polite language and greetings go a long way. You might even catch a break on prices. A good source of inexpensive clothing is at an open-air market. Weekly markets in smaller towns and daily in larger cities usually have a good amount of clothing vendors. They tend to have unique styles, and prices are usually better than you'll find in the larger malls or chain stores.